THE WOODLANDS, TX--(Marketwired - April 04, 2016) - Therma-Flite, a leading provider of resource recovery technology and services, today announced that it was awarded a contract to provide a biosolids drying system for a Wisconsin sewerage commission. 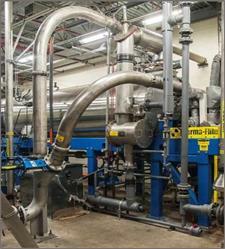 Funded by a low-interest loan from the Clean Water Fund, the project is a joint effort by two cities to upgrade from Class B, to Class A biosolids of exceptional quality (EQ). Two main goals of the upgrade include helping alleviate a phosphorus-based pollution issue in their water streams and solving the problematic restrictions and diminishing acreage available for land application of Class B biosolids. "We are seeing mounting pressures on municipalities around the country to upgrade to Class A biosolids due to increasing regulatory limitations on land application of Class B biosolids," explains Peter Commerford, VP Sales for Municipal Drying Technology at Therma-Flite and a leading expert on biosolids management. "The Therma-Flite drying system was selected because it proved out to be the best fit due to the need for a cost-effective solution with a modest footprint that fits into existing buildings at the WWTP. Therma-Flite's unique sealed drying chamber design provides ultra-low oxygen conditions for improved safety and very low off-gas flows for economical odor control." The engineering company consulting on the project conducted the technology assessment and presented its recommendation report for the dryer to the Public Utility Commission. A compelling fact influencing the final decision was that Class A biosolids can be applied anywhere and is a very effective fertilizer for golf courses and landscaping. The growing demand for Class A biosolids is partly due to its 4-5% nitrogen which is released slowly over time and that it contains many micronutrients that have shown to be beneficial to crop growth ultimately reducing costs associated with purchasing other fertilizers. The Utility Commission approved the proposal with a unanimous vote. Therma-Flite, a leading resource recovery technology and services company, builds innovative thermal processing systems that extract resources that would otherwise go to a landfill or to waste. Serving municipalities, oil and gas, power and other industries, the company helps customers in NA as well as Europe and Asia, maximize the value of their waste streams in an environmentally responsible manner. For more information, visit www.therma-flite.com.